I typically like to take pictures outside - which is why I haven't shared my hauls of late. Mother nature has not been on my side. Other than a quick snap or two here or there I've been hiding indoors. I finally decided to try shooting inside and you can see why natural light is always better. On the Rack front, they've just finished inventory so now that shipments have resumed I expect we'll be seeing lots of transfers from the main line. My recommendation is to keep your eyes on your local stores for the next few weeks. I picked up these Converse at the last Clear the Rack and never shared. For $9.99 less 25% I decided to add them to my shoe closet. My most exciting find of late was this Lela Rose Moon Dust Sheath for less than $100. My shopping buddy laughed as I squealed and snatched it up quick. I haven't seen any of her dresses at the Rack for less than $400. The tag says that this one retailed for $1,495 but when I googled it I found it for $1,895. It's currently available to rent on Rent the Runway for $170 - which is more than I paid to own LOL. Score! I also found this cute Rebecca Minkoff butterfly mini dress for $39.97 (retail $268). It's missing the slip of course so I'm on the hunt for a good slip to wear with all the sheer dresses I've been buying of late. And now for H&M. I got a tip that prices were gonna be slashed again on Tuesday so I headed in to see what I could find. The extra 30% ended so honestly prices are about the same as they were this past weekend. I always look for the collection pieces - like this fish print maxi dress. It was ticketed $149 but I got it for $15. It's currently still online for $79.99. I already picked up the shorter version of this Chloe-wannabe dress when the sale first started for $25 but I wanted this one as well. It was also $15. It's missing a tassel and needs a slip but I think I can work with it. On the fence with this fringed sweater. I like the idea of it but it doesn't really do anything for me. It was only $7 but I think my biggest problem is that it doesn't look very expensive. We'll see. These stretch jeans were $7 and a little big but I currently only own one pair of jeans so I wanted another. This denim jacket came out to only $10 and it's super stretchy. You really can't have enough denim jackets. I saw this pink scarf from across the room and knew it was meant to be mine. It's HUGE and only $3! The winner of the iMac and Kate Spade giveaway has been announced - you can see it in the gleam widget in my post here. Congrats to Saegan A. and Debbie D.! 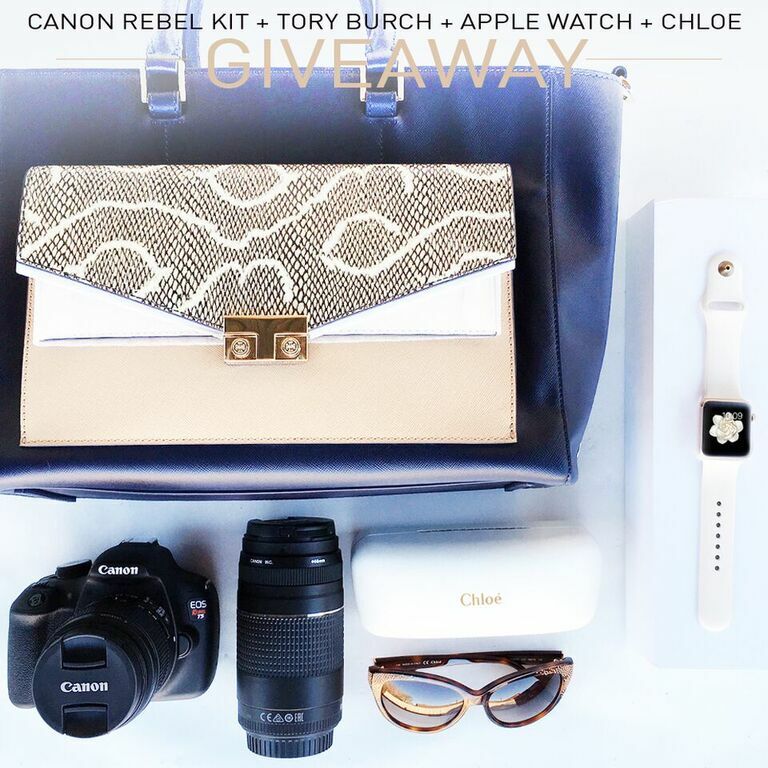 Right now I'm participating in another giveaway on Instagram - you can enter to win everything pictured including a Canon Rebel Kit, Tory Burch bag, an Apple watch and Chloe sunnies. Click here for details! Would love to hear what you guys scored this week! Great scored at Nordstrom Rack! I saw a gorgeous chloe look alike at H&M as well but only size 2 left which didn't work. :( It wasn't even part of the sale; I just wanted it lol! The Chloe knockoff dresses run big - the maxi one pictured above is a size 2 and the shorter one I got was a 4 - and I am neither of those sizes LOL. Oh please - I'm sure you've Racked several times since this comment LOL. I have that Chloe inspired dress and love it. Didn't wait for the sale though :( went to AYR sample sale today and got some great jeans for only $5 bucks. Also got 2 sweaters and a jacket for $5.00 all still online at full price. Yea samples!!! Gotta love samples. I'm staying local unless it's a killer sale. I'm also a little broke LOL. YOU ONLY OWN ONE PAIR OF JEANS?! I guess that's about as bad as me only owning 3 skirts....lol. That Lela Rose dress is gorgeous! I love the idea of RTR, but I have to laugh when I see the prices because like you, I usually pay less to own it haha! I'm a dress girl. I easily have 200 dresses (maybe more lol) but I don't like wearing jeans unless I'm size tiny. So for this size I have one pair of jean...but I'm looking for another LOL. Used gear is ending up progressively prominent Song Hye Kyo Anti Aging Products because of the increasing expense of purchasing new.